Total reported signal Incidences during 2010-11: 151 as against target of 167 (Improvement of 9.6% over target &16.6% over 2009-10). Total SFR failure during 2010-2011: 1663 as against 1960 (Improvement of 15.2% over 2009-10). It can be seen that Reliability of Signalling gear was poor as compared to target & last year during 1st quarter. Afterwards management initiative viz ABC analysis, identification of good & bad stn, daily monitoring of SFR, identification of week maintainerfollowed by continuous training, knowledge up gradation through Confidence Building Course (CBC) at DTC through in house Key Resource Personal (KRP). Regular counseling followed by strict action for bad maintenance & recognition for good Maintainer. Provision of predictive maintenance/monitoring system resulted in substantial & visible improvement in Reliability has been ensured. Established DTC for Signal & Telecom maintainer at DD by utilizing existing resources & in-house expertise without any extra expenditure. Introduced the Concept of CBC (Confidence building Course) for week maintainer through KRP (key Recourse Personal). Total 414 maintainer including 56 weak maintainer) trained by 18 KRP during the year 10-11. Introduced the concept of recognizing excellent efforts done by maintainer/supervisor. 7Class IV, 19 maintainer & 3 supervisors (Total 29) rewarded by DRM during BOM for ensuring the excellent reliability of signalling & telecom gears. Introduced the concept of evaluating/monitoring good station/section with SFR failure<1, bad stn/section (Number increased from 22 in April10 to 38 in Feb 11) with SFR failure>4 Number decreased from 12 in April10 to 01 in Feb 11). 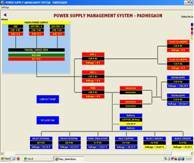 Commissioned the GUI based Remote Power Supply Monitoring System (PMS)to monitor individual module ofIPS & Incoming supply through electricity board/DG set fromTest room inDD-MMR section1ston IR. To improve reliability & visibility of colour light Signaling LED based signal lamps have been commissioned at 126+(216 by const) Nos of aspects as against target of 100. 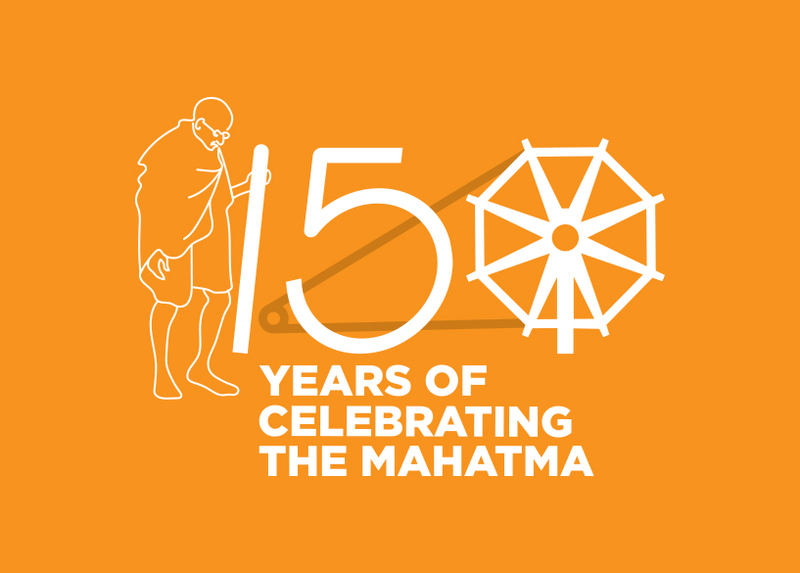 With this total 1441 aspects out of 2690 main aspects & 1018 auxiliary aspects o­n division. 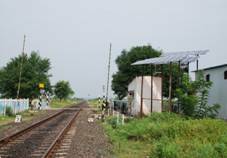 LED Signal has been provided for the all Signals in DD-MMR Section. To improve visibility of Signalling aspect 200 Nos of Polycarbonate lenses have been provided at subsidiary signals as against target of 200. To improve battery backup 28 sets of IPS batteries have been replaced. IPS commissioned at three LC gate (LC-61(TLT-AKOR), 76(YL-ANK), 24(BGVN-JNTR). Fuse alarm system along with duplication of fuses has been commissioned at 19 locations against Target of 18 in 10-11. 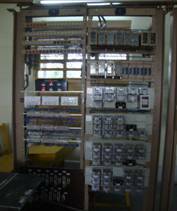 With this Fuse alarm system have been provided at 70 out of 72 stations. Track Battery Monitoring System provided at 25 Nos/ Target 25. With this total 65 out of 72 stations. 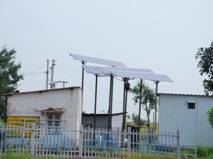 To improve reliability of signaling circuit Maintenance Free Earth has been provided at 24 stations/ Target 20. With this total 71 out of 72 stations have been provided with Maintenance Free Earth. Microcontroller based ELD provided 13 stations and potential free contact wired to Data logger. 38 MBC Turn out has been provided o­n division. 3 Nos of Q series PTJ type Block Instrument provided by replacing old version of NV1 type. Interlocking of 3 mid section LC gate/Target 2 (One in 31-3-10 & 2 in 10-11). LC gate to station communication provided at two manned Gates in UMD – LUR section. 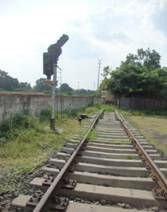 Long pending Traffic facility work of extension of loop line has been completed at 10 stn (7 in 31-3-10 & 3 in 10-11). 06 panel interlocking stations have been commissioned between PVR-MRJ section by S&T (Const.) along with this 6 data logger & 6 IPS were also commissioned. 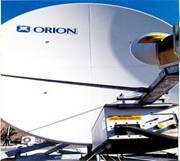 V-SAT for extending communication to site & video from site to HQ & Divisional control Commissioned at ART DD. Live telecast of disaster management exercise at DD o­n 18.3.11 through VSAT was done for the 1sttime o­n CR. Commissioned CMS at KWV Lobby. 8.Scrap Disposal: 115 MT as against target of 40MT. Implemented 5 digit train numbering system for all the Mail Exp & Passenger trains in Train Indicators / Coach Guidance system/PC based announcement within target. 10 Nos GPS clock provided at 5 stn. 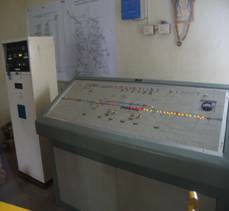 Coach Guidance System commissioned o­n PF- 6 at DD & 1 Multiline Train display provided at LUR. UTS commissioned at 5 stations in PVR-MRJ section.